This new design will be sure to bring a smile in Grandma's heart . You will receive a Gildan heavyweight blend 50/50 sweatshirt. All shirts are unisex sized. 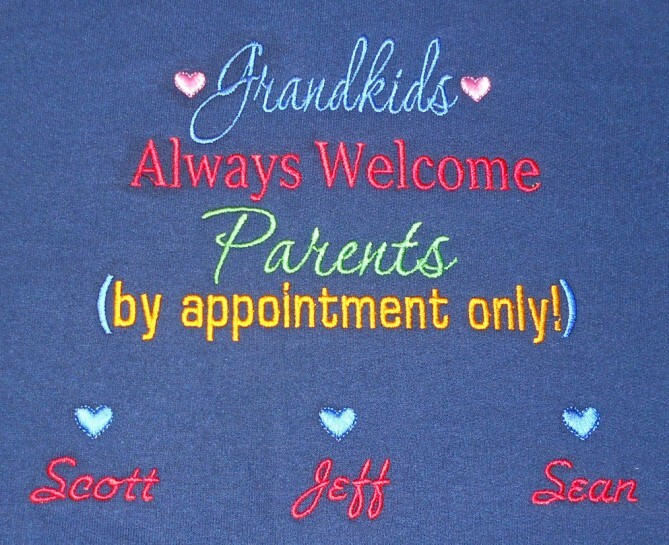 I will embroider your design on the front chest of your sweatshirt. I will adjust the thread colors according to the color shirt being used or you may request your colors. The design as shown is 9" x 7 1/2". The size will vary according to how many children you add. This price is for the design with up to 4 names. Any additional names are $2.00 each. I use the finest rayon embroidery threads for long lasting and brilliant color. If you would like the names in any particular order, please enter that in the "Special Instructions" area.